Why should we care about Falcons/Kārearea? One of 38 species of falcon worldwide, the New Zealand falcon is endemic to this country. It is estimated that the population is likely between 5000 - 8000. Therefore that makes them rarer than the Kiwi. Do we get different types of Falcons/Kārearea in New Zealand/Aotearoa? There are three ecological forms of falcons. The small dark ‘Bush’ falcons live in forests. They are found in the North Island, mainly south of Hamilton; and NW South Island as far south as Greymouth. Large paler 'Eastern' falcons live in open dryer habitats east of the Southern Alps but extend from coast to coast in central South Island. 'Southern' falcons are intermediate in size and colouration and live in Fiordland, Stewart Island and the Auckland Islands. The New Zealand falcon is capable of flying at speeds over 100 km/h, and can catch prey larger than itself. They hunt live prey, mainly by watching from a vantage point and making a fast direct flying attack and either striking or grasping the prey with their feet which are equipped with sharp talons. They kill their prey with a quick powerful bite to the neck. Their diet includes a range of animals, including insects, small mammals and lizards, but consists mainly of birds. What does it mean when something is threatened? Threatened species are under threat from becoming extinct. The Department of Conservation, in partnerships with top academics from around the country has set a classification scheme for the threat status for each native species. Those that are threatened are a priority for conservation and while they aren’t critically endangered (as some endemic species now are), if their populations continue to decline they will become critically endangered at which point it will be very difficult to bring them back from the brink of extinction. Doesn’t the Department of Conservation (DoC) look after threatened species? 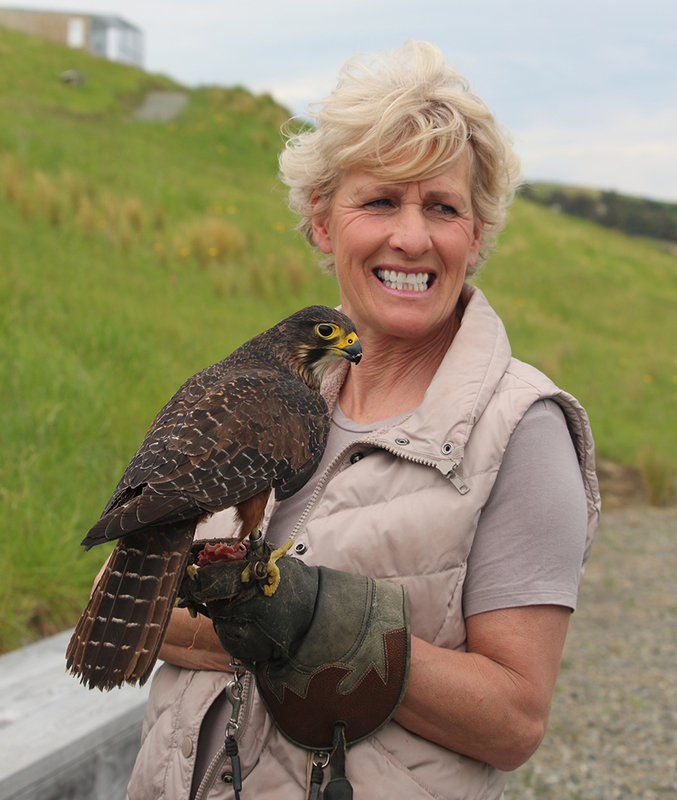 New Zealand has nearly 3000 threatened species for which DoC only has funding for about 250 – it is imperative that local communities get behind those native creatures such as the New Zealand falcon, who do not currently have a conservation program in place. How well can they see? Falcons have eyesight 8 times better than humans, but unfortunately their night vision is not good which makes them an easy target for wild cats, stoats and ferrets. We don't know exactly but they have been clocked at speeds exceeding over 200 kph. That's twice the New Zealand legal driving limit. The males and females are different. The female is close to one third larger than the male: Female falcons weigh around 500 grams and are approximately the size of a magpie; Male falcons weight about 350 grams and are approximately the size of a domestic pigeon. Falcons almost always nest on the ground. They create a ‘scrape’ on the ground, usually in the depression underneath a large boulder or under a fallen tree to give them cover from the elements and to protect them from any aerial attacks. While it may seem counterintuitive to make a nest on the ground, we must remember that falcons evolved with other birds of prey (such as the Haast Eagle) as their main predators, so nesting on the ground actually provided more protection from above than nesting in a tree would have. They lay between one and four eggs each year. Average clutches are normally 2 or 3 eggs. How long does it take for eggs to hatch? Normally eggs hatch after 31 days, with the chicks leaving the nest about a month later. In this time, their parents feed them around 10 times per day. When chicks are born they are totally dependent on their parents for food, warmth and shelter. They can’t even see. What do chicks look like? They are born with a fine down that helps to keep them warm. Once they reach about 12 days of age they develop a thick grey down which helps keep them warm so mum can help dad hunt for more food. By the time they are 35 days old, chicks are fully grown and have developed most of their flight feathers. Aren’t falcons only a high country bird? Why are you releasing them in valleys? A common misconception about falcons is that they are solely ‘high country animals’. This is not true, without persecution, introduced mammals, electrocution, and habitat destruction, falcons would be found all over New Zealand. Falcons are extremely well-adapted to hunting avian prey, but they do sometimes catch mammals (mainly rabbits and mice), reptiles, and insects. Scientific research conducted in Marlborough by Dr. Sara Kross has shown that falcons prefer to hunt for introduced birds and actually select against eating endemic bird species, even when they are available in the surrounding habitat. How old can they live? In captivity some falcons have lived for about 15 years. The oldest known wild falcon was a female who lived to be 9 years old. Falcons are normally silent, counting on stealth to hunt for their prey. When they do make noise, it is often in territorial defense- this noise is called ‘Kekking’. Falcon chicks sometimes ‘Whine’ to beg their parents for food. Female falcons also whine to tell males they need more food for the chicks or themselves. Falcons can make a ‘Chittering’ sound which is often heard after copulation or during play. I saw a raptor in the sky - was it a falcon? Because falcons are so rare, it’s a good chance that you didn’t see a falcon. Harrier Hawks are much more common and tend to hunt by soaring through the air and looking down to spot carrion or easy prey. Falcons, on the other hand, usually hunt from a perch, from which they will swoop down and fly directly at their prey using quick wing beats and looking straight ahead. Click here for our page giving more information on the differences between falcons and harriers. Do falcons eat native birds? Why would you want to increase their numbers? Research in Marlborough has actually shown that even though falcons evolved hunting native birds, they actually prefer to eat introduced birds. The vast majority of falcon prey are introduced finches. This may be because endemic birds evolved with falcons as their main predators and therefore have better antipredator behaviours. Or there may be a nutritional explanation. We want to increase their numbers because ecosystems cannot function naturally without predators present, and the falcon is the only endemic bird of prey left in New Zealand (several other species are now extinct). Predators are needed to keep their prey populations in check, and without predators there are often more cases of disease outbreaks and starvation in prey species. We don’t know! We often get this question from children and can’t give them a true answer. We know that we’ve watched falcons fly so high into the sky that even with binoculars they actually disappear from view altogether! Falcons are found throughout New Zealand in areas South of Auckland. On the South Island, falcons are often described as being a high-country bird because this is where they are most often spotted. However, this term is incorrect. Falcons were found throughout almost all of the habitats in New Zealand prior to human settlement, and have only been driven into the high country because of persecution by humans and the introduction of predatory mammals. We are a locally-run Charitable Trust working to increase the numbers of falcons in the wild in Marlborough, we also rescue and rehabilitate injured falcons at our aviary. The MFT are fierce advocates for falcons and are incredibly active in the community raising awareness through our school programme and visits to local festivals, clubs and groups. Aren’t you just doing this to help the vineyards? NO! This project is about increasing the numbers of falcons and raising the profile of falcons in the community. 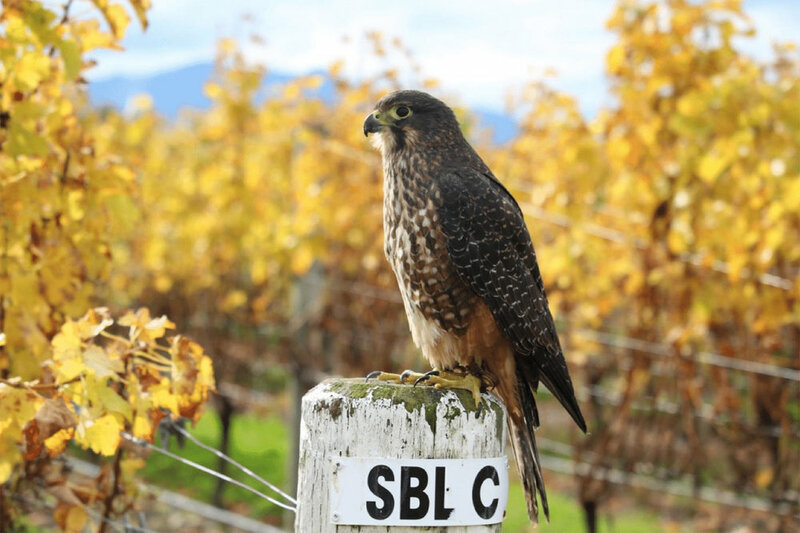 We are releasing falcons into territories at the edge of the known range of wild populations in Marlborough. These locations often are vineyards, but not necessarily so. We choose release sites that are the most appropriate for the falcons.